The Downtown GID is a property tax district formed by property owners in 1976 for the purpose of funding parking, pedestrian, and street beautification improvements. See the map in the Downloads box for the specific boundaries. The GID is managed by City staff, and City Council sits as the governing Board. 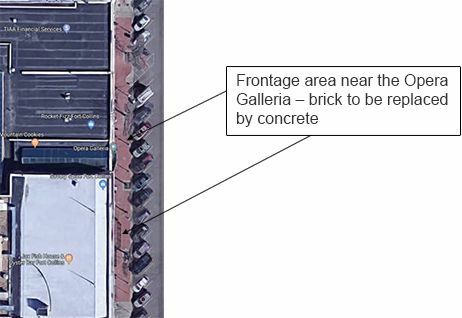 Examples of past projects include College Avenue corner plazas, medians and street trees; Oak Street Plaza with its fountains; Linden Street streetscape; recent sidewalk replacements; and on a smaller scale, the sidewalk bike dismount signs and decals. Additional Information: All affected businesses will remain open; flaggers will assist pedestrians to business entrances. Why Did We Need This CIP? The CIP for the Downtown GID was last updated in 1994. That CIP consisted of a memo to City Council that identified a list of potential projects to be pursued over approximately a 15-year period. Most of the projects on that list have been done, and bonds that financed a group of the projects were retired in 2009. A number of issues and ideas emerged over the past several years regarding the use of the GID fund. A new CIP was needed to address those topics, and to identify the next generation of potential projects to be pursued with the GID fund, from 2012 going forward for about 15 years. The GID is a major factor in the look and feel of College Avenue in Downtown. 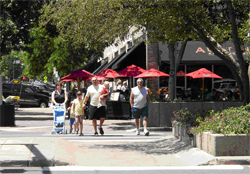 Landscaped medians, corner plazas, and street trees are enhancements largely funded by the GID. Also, Oak Street Plaza, the Oak/Remington parking lot, and Linden Street enhancements exemplify the activities of the GID. What's the General Outline of the 2011 Capital Improvement Plan? The CIP involved property owners, who self-fund the GID, and other stakeholders in determining how the GID should continue to invest in Downtown public improvements. The City's Advance Planning staff manages the CIP, in collaboration with other key City departments the Downtown Development Authority and the Downtown Business Association. The CIP was presented to City Council members, who sit as the governing board of the GID, for approval.